The prodigious Gagosian Gallery has announced that it “is pleased to present a special exhibition of contemporary Indigenous Australian painting from two significant American collections - the Kluge-Ruhe Aboriginal Art Collection of the University of Virginia and the Collection of Steve Martin and Anne Stringfield. Spanning three generations, the exhibition includes works by leading painters from the Central and Western Desert regions”. This is an extraordinary breakthrough for Aboriginal art – one that I've been predicting in America for some time. Several serious collections by US collectors have been touring for a year or two now to whet the appetite. But surely the three national tours by Dennis Scholl - once a collector of trans-Atlantic contemporary art well known to Gagosian who then dedicated a decade to what he originally called Aboriginal abstraction, which allowed his tours to enter the hallowed halls of America's contemporary art institutions – have had the major influence. And acceptance – even for a non-selling show – by Gagosian, which has five outlets in New York, three in London, plus Paris, Rome Geneva, Hong Kong, San Francisco and Los Angeles, raises an expectation of bringing our Indigenous art to the attention of their clients who normally shop for William de Kooning, Jeff Koons and Cy Twombley; Henry Moore or Richard Serra; even a handful of female artists such as Helen Frankenthaler and Jenny Saville. Of course, it's just possible that Aboriginal art was forcefully brought to Gagosian's attention when they showed a Damien Hirst exhibition in Beverley Hills last year. 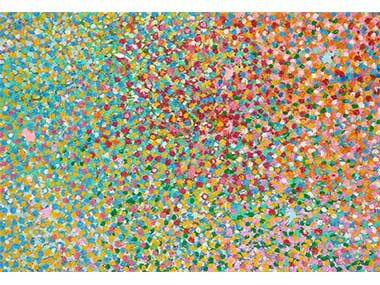 For created an explosion of Indigenous ire as Hirst’s series, 'The Veil Paintings' was widely (and not always favourably) compared to the intense dotting of Emily Kngwarreye and other Utopia artists of the Ngale and Pwerle clans. As the artist himself said,“ A veil is solid yet invisible, and reveals and yet obscures the truth, the thing that we are searching for”. His denial of any familiarity with Aboriginal art was disproved by Aboriginal Art Directory. Gagosian is offering only Desert artists in May – Anmatyerre, Pintupi, Luritja, Pitjanjatjarra and Kukatja. They are Emily Kame Kngwarreye, Makinti Napanangka, Yukultji Napangati, Naata Nungurrayi, Ronnie Tjampitjinpa, Bill Whiskey Tjapaltjarri, Warlimpirrnga Tjapaltjarri, Tjumpo Tjapanangka, George Tjungurrayi and Willy Tjungurrayi . “Many of the works in this exhibition”, Gagosian told its clients, “made during the last twenty years (actually thirty), reveal the ways in which subsequent generations of Indigenous Australian artists have responded to their progenitors at Papunya, and attest to the increasingly prominent role of women artists among them. While the first Western Desert paintings directly depicted signifying symbols and ideograms, later artists sought to obfuscate overt references, dotting and over-dotting as a means of protecting sacred designs. This strategy of simultaneous exposition and concealment yielded unparalleled visual feats, as each artist presented a continuum between states of waking and dreaming, ephemerality and permanence, representation and direct experience. 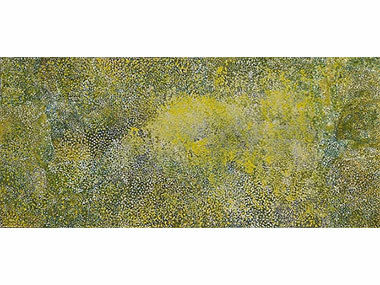 “The dotting technique is exemplified in an untitled painting from 2001 by Willy Tjungurrayi (born c. 1930), one of the few remaining artists of the first generation. Small whitish spots create an undulating terrain over a dark ochre ground, referring to 'Kaakurutintjinya' (Lake Macdonald), a dry salt lake that features in ancestral stories of young male novices traversing the landscape. In George Tjungurrayi’s (born c. 1943) and Warlimpirrnga Tjapaltjarri’s (born c. 1958) charged rectilinear compositions, tight concentric lines create mesmerizing effects, like the direct retinal experience of water or contoured earth shimmering in the sun. “Some paintings refer to sites of sacred or historical significance, acting as maps of real space as well as the liminal realms of memory and dreams. 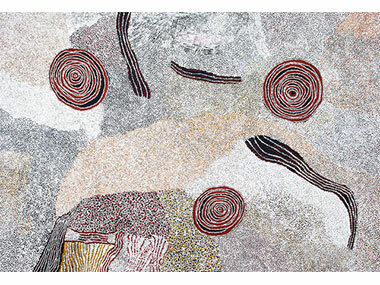 In an untitled painting from 2010, Naata Nungurrayi (born c. 1932) depicts Karilywarranya in the Pollock Hills, where she grew up. Clusters of red, orange and yellow dots form a sort of aerial view, and winding lines and coils refer to ancestral pythons, local topography, and vegetation. Yukultji Napangati’s (born c. 1970) painting, 'Ancestral Women at Marrapinti' (2017), concerns the women who stopped at symbolic sites to make bone jewellery for young women in their rite of passage. “In her brief but prodigious artistic career, Emily Kame Kngwarreye (1910–1996), an Anmatyerre elder from the Central Desert area, also focused on women’s activities, from batik making to the harvesting of seasonal crops. The freedom of her virtuoso stylistic approach ranges from the delicately pixelated fields of colour and structure in 'Hungry Emus' (1990) to the wild and urgent brushstrokes of 'Kame Yam Awelye' (1996). “Despite evident resonances with mainstream abstraction, Indigenous Australian art emerges from a fundamentally different line of inquiry. Rather than reacting to formal and conceptual tendencies from which they remain largely isolated, the Desert painters condense innumerable layers of history and lived experience into a dazzling diversity of visual languages, connecting contemporary viewers to the most ancient surviving culture in the world. Melbourne dealer, D’Lan Davidson has been involved in this project, which follows from his own increasing exposure to the American market. As he told his clients recently, “My experience in New York has got me incredibly motivated and enthusiastic about the year (and years) ahead. Watching seasoned collectors and leading art world authorities experience Indigenous art up close for the first time in New York, completely out of their comfort zone, and seeing their thirst to know more about the artists, the work and their culture – has strengthened my resolve to make some changes in the way I do things. It’s time to take things up a notch”. Watch this space!